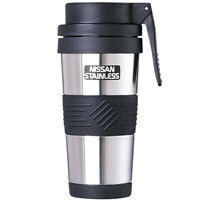 14 ounce mug Full five-year warranty. Easy to use lever action spill-resistant lid. Fits into most car cup holders. Has same size base as a soda can. Superior patented vacuum insulation.